My time in Antigua is coming to an end. I leave on Wednesday. Today is Mother’s Day. Tomorrow is the twins’ birthday. Hearing their little voices today – they sounded like chickadees – I’m ready to go home. To prepare for our liveaboard adventure, my husband has sold most of our large furniture. Today, over the phone, we decided that we would rent a 5′ x 10′ storage space for some sentimental items. I am struggling to part with my bicycle even though it makes my neck and shoulders ache. My husband wants to keep the living room set that he bought before we met. Without sounding like I’m singing soft rock – it’s emotionally difficult to sell some of our things, which may explain why we’ve left this nasty task to the bitter end. Plus, we’ve been really busy building up our sailing skills, and doing everyday things. Groceries, laundry and tasks like completing our taxes seem to multiply like rabbits with a family of six. Today, to give us a push in the right direction, my husband carried our storage boxes upstairs from the basement. He has put the boxes in the living and dining room. 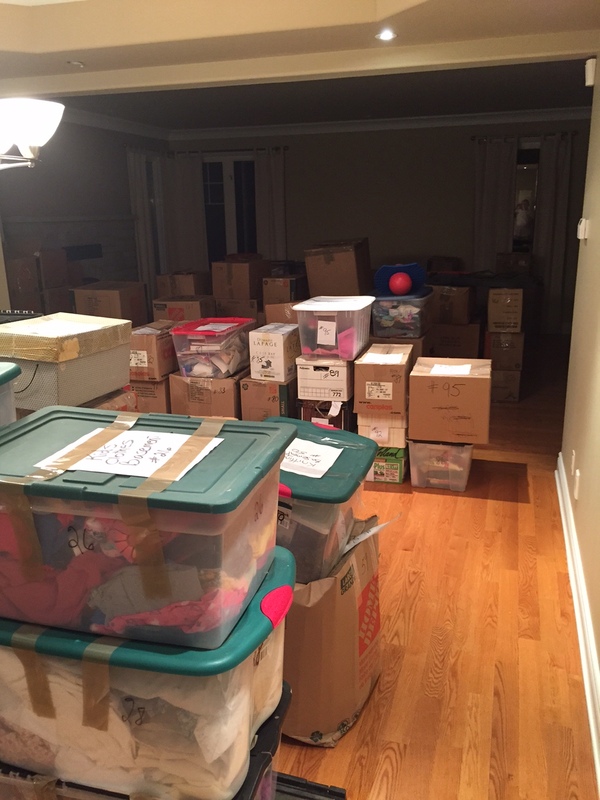 By June 15th – our newest target date to move – all of these boxes must be sorted, saved, given away or sold. It’s rather daunting. We have a similar quantity of things stored in our garage. We have tenants moving in for two years, starting on June 30th. Why did we think we needed so much stuff? Within a couple of days of my return from Antigua, my husband flies to Florida with our daughter, Betty. We are doing a refit on our catamaran. So, there will be no escaping the task of downsizing. 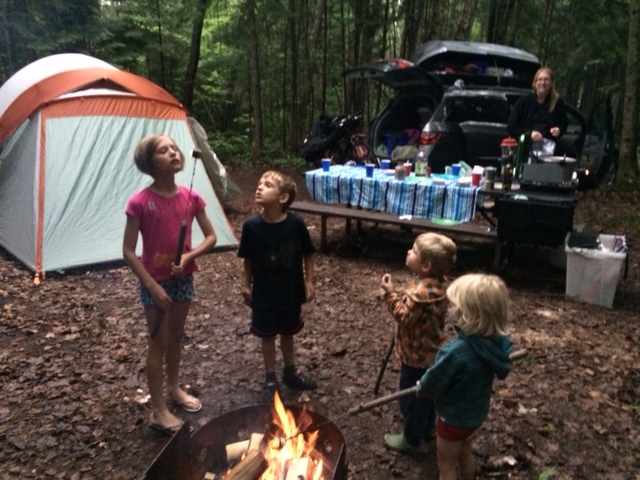 As of June 15th we expect to be living in a local Ottawa campground – while our children finish their last couple of weeks at school. And, my living space will look like the following photo. Imagine making school lunches on that table. My kids will be happy and smell like wood smoke. No news yet as to when we will be moving to our St Francis 50 catamaran, SV Aphrodite. Thank goodness I spent most of today reading in a hammock. I’m happy to be going home. But, with home schooling, selling our van and learning to sail – it might be years before I have such a quiet day again.